In a case which could set an important precedent for the protection of England’s designated Battlefields under the National Planning Policy Framework [NPPF], following strongly worded advice from Historic England and Northamptonshire County Council’s Archaeological Adviser, Planning Officers at Northampton Borough Council have recommended that a controversial planning application to extend the car park at Northampton’s Delapre Golf Center, on the historic Wars of the Roses Battlefield of Northampton is refused. The planning application is retrospective, the Golf Center having been discovered to have carried out damaging unauthorised works on the registered Battlefield site in early 2015. The Council was forced to intervene in February 2015 when local people noticed that the Golf Club was apparently undertaking ground works for a proposed car park extension, which lies within the archaeologically sensitive designated Battlefield of Northampton, without having first gained planning permission. Of particular concern to battlefield experts was the fact that the unauthorised works were taking place in the same general area of the designated Battlefield where what is currently the earliest known round shot from a cannon fired in battle in Britain was identified in 2015. The result was that under pressure from local politicians and campaigners from the Northampton Battlefield Society, the Council issued a Stop Notice to the Golf Club and demanded that the Club undertook remedial works. The Club was also required to commission an archaeological assessment of the damaged area which was undertaken by Museum of London Archaeology [MOLA]. Finds included lead shot which could be medieval in date, as well as a late medieval brooch. With the MOLA assessment completed, in August 2015 the Golf Club submitted a retrospective planning application for the car park extension and also for a trench and ball catching pit. However, the application faced a wave of criticism from both local people and national bodies such as the Richard the Third Society and the Battlefields Trust. Of particular concern were drone images of the site taken during the rush hour on a weekday morning which appeared to show that the existing car park was considerably underused, throwing the whole reason for the Golf Club wanting to build the car park extension into question. A theme taken up by the official submissions to the planning committee which question whether the Golf Club has established its need to extend the car park at all. It is also noted that the application makes no attempt to address any of the issues around the trench and ball collecting pit. Of particular interest to archaeologists and conservationists involved in planning cases is the fact that among the 217 written objections to the scheme considered by the Planning Officers is advice from two of the Council’s statutory advisers, Historic England and Northamptonshire County Council, that the Heritage Impact Statement provided by Delapre Golf Club as part of the planning process was inadequate. The advice points out that the Impact Statement does not fully appreciate or understand the issues around the setting of the battlefield and in a number of areas the statement is even described as potentially misleading. This level of criticism is significant because , while there is no suggestion that this is the case at Delapre, it has long been a criticism of the planning system that there might a temptation on the part of some archaeological consultants to deliver a report to suit the demands of the client to get their planning application passed at minimum cost, rather than report objectively the full heritage value of the site in question. Therefore any sign that statutory bodies are cracking down on inadequately researched and written Heritage Assessments is potentially important nationally. The eyes of battlefield archaeologists and conservationists across the UK will now be on the Northampton Planning Committee and it will be hoped that the strong stance taken by Historic England and the County Archaeologist in the face of Delapre Golf Club’s unauthorised work will be supported by the elected members of the committee. Those members will be particularly aware that any attempt to pass the scheme would appear to fly in the face of, not just of the advice from their own officers and statutory advisers, but also of the Council’s own conservation policy for the historic Battlefield of Northampton which it commissioned following the national outcry over a previous attempt to develop part of the battlefield for football pitches, driven by former Council Leader, David Mackintosh MP. The proposal is due to go to the Northampton Borough Council Planning Committee on 15 March. In a separate development, the Northampton Battlefield Society, which led the charge to prevent the commercial development of the battlefield, has published a new book which brings together primary sources and the most up to date archaeological and landscape research to place what was one of the first and most important, but today least known, battles of the Wars of the Roses in its historical and military context. 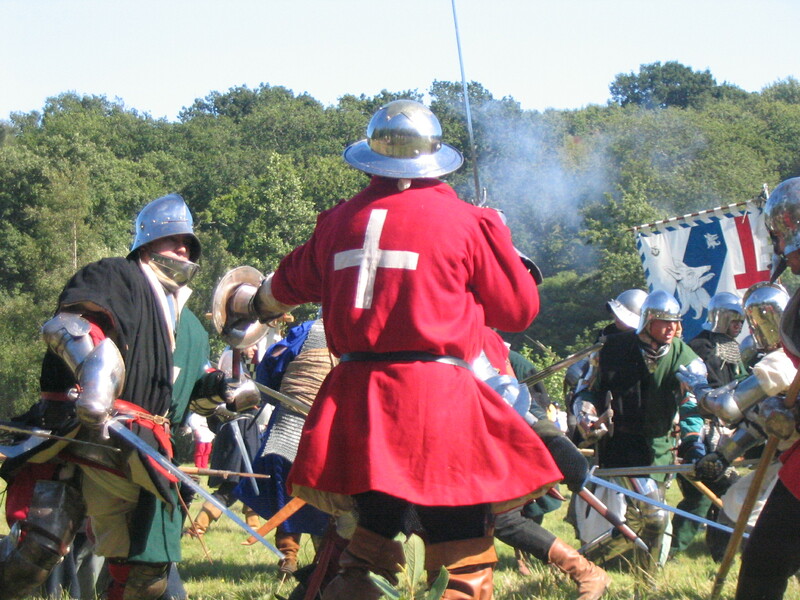 Notable for the presence of leading players in the Wars of the Roses, including King Henry VI and his wife Margaret of Anjou, Edward Earl of March, the future King Edward IV, and Richard Neville, Earl of Warwick, known as the Kingmaker, the battle was the only occasion during the war when an army assaulted a fortified camp. Written by military historian, Wars of the Roses expert and Northampton resident Mike Ingram, the book is available from Amazon price £9.99. The book will is also available form Northampton Museum and will be available at a number of Wars of the Roses events around the Midlands. In what may be a sign of things to come in publication, the book has been published by the Northampton Battlefield Society under its own imprint and all proceeds will go to support the work of the Society in conserving and presenting the battlefield to the public.